We are very proud to announced this property has been evaluated as a PLUS home in January 2019 and is now part of an exceptional home collection. All homes in this exclusive collection are through invitation only and are independently and rigorously inspected including a three to four home visit. During this visit all aspects of the home are examined including safety cleanliness, comfort, maintenance and the services provided by the host. We are very proud to present our most recent Prague property purchase. This stylish, perfectly positioned Old Town apartment is one of the most unique of our ten successful Prague holiday apartments . Most city center apartments have problems with the noise factor, however this stylish two-bedroom apartment looks out from the rear of the building over the red roofs of the Old Town and that, together with the thickness of the old monastic walls, gives our tenants peace and quiet, even when enjoying a glass of wine on the balcony. The original building was a monastery with the exterior building dating back to the 16th century. The building where the apartment is positioned dates back to the 18th century and was fully renovated in 2012 and our apartment in 2017. There is no elevator but as the apartment is on the second floor , there are not many steps to climb , and there will always be someone on hand to help guests with their luggage. Once you step out of your tranquil retreat and on to the main street (jilska) you are in the heart of it all with an abundance of restaurants, boutiques and shops in the immediate vicinity; 5 min to Charles Bridge, 3 min to Wenceslas Square and subway station,5mins to Old New Synagogue,and Old Jewish Cemetery; within a few minutes walk of all the major theatres, concert halls, museums and various entertainment venues.The fashionable Parizka St with luxury brand name stores is just across Old Town Square which is 2 mins walk away and the local food market is 1 min away in Havelska st. 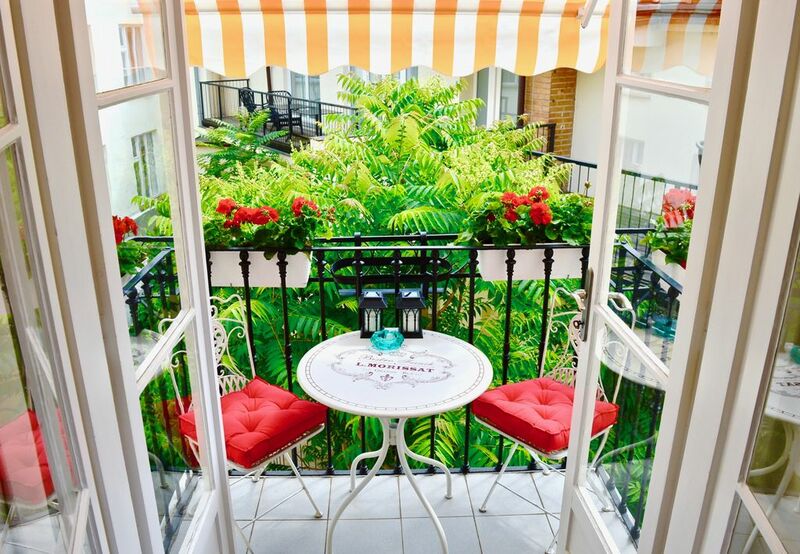 This two bedroom Old Town apartment offers stylish living in a bright and airy property. Large comfortable, double/single beds, plenty of space (1000 sq feet) to spread out into whether you are a couple , a family or several friends. There is a large kitchen dining room with two windows which allows the sun to stream into the apartment and a balcony which enables one to eat al fresco . Our other seven apartments ( 97558, 811627, 88378, first and second floor,1980948, 8339514,93243) have gathered approximately 450 five star reviews on HomeAway and 750 five star reviews on all advertised platforms which has set a high bar, but with this new property we believe have not just met, but surpassed the exceptional standards we already offer. This will be one of our most popular Prague apartments and an experience we promise will stay with you long after you check out . We are fully licensed accommodation providers and respect all local laws regarding payment of tax (Stay Tax, VAT and income) and registration of guest details. All our apartments also adhere to safety standards and are equipped with gas and fire detectors. We are happy with newly clarified laws (2017) relating to greater regulation of the holiday-rentals sector in Prague . We believe it is in the interest of our guests and the industry as a whole that we follow all local laws and run a proper and fully legal business operation. We also expect all our guests to respect other owners/ long-term tenants in buildings where we have our apartments, but over eight years we have had very few problems. We look forward to accommodating you. My wife and I bought our first Prague property in 2004 and have since built up a portfolio of eight holiday apartments with a value of approx 137m CZK/6,5 m USD, of which approx 1,7 m USD is owned and the rest leased. We specialize in short-term rentals which we manage together with a small team through our sro MJMorris Apartments and Developments. We develop properties from complete renovation and/or refurbishment into successful holiday lets and acquire apartments through lease or purchase in the most prime locations the city has to offer. We still consider ourselves a ‘boutique’ business with a philosophy of quality over quantity with the number apartments we take on. We take great care in both design and presentation of our rentals, as well as the services we offer. We have a small and dedicated team who all have approx 10 years experience in hospitality and we only take on renovations projects which capture the spirit and history of Prague while maintaining all the comforts of modern living. We are very proud that our apartment 88378 (first floor) was recently featured in a double page spread in the Daily Telegraph Newspaper a UK national newspaper (see pics of 88378). The article also included our thoughts on the benefits of Prague property investment. We also provide consultation in all aspects of Prague real estate investment but specialize in the holiday rental sector. We are especially excited about merging property development with tourism. We are passionate about what we do and with approx 700 five star review of our eight Prague properties (8339514, 8460118, 88378 first and second floor, 97558, 1980948, 811267 and 93243) advertised on three platforms, feel we are on our way to achieving our goal of providing the best Prague holiday apartments and services on the market. We look forward to accommodating you and/or sharing our invaluable experience in what is an fast-moving and dynamic growth industry. We take great time and care acquiring our furnishings in an effort to create a unique and original experience for our customers. We feel it is important to differentiate ourselves from the ‘four walls and Ikea furniture’ format which is standard in many holiday-let apartments in Prague. We prefer to focus on a lower number of apartments so that we can maintain and develop each of them with an attention to detail true to our boutique style and principles of quality over quantity. Our apartments are cleaned and maintained to the highest level and our improvements in both comfort and decor are ongoing. Since we started in 2008 our properties have acquired 660 five star reviews across three major channels. We are superhosts on Airbandb and have an average five star rating from 460 reviews on two other well-known sites. All our renovations aim to capture the spirit and character of the building/ apartment being restored and we only take on projects where we feel this can be achieved to the highest possible end. We are particularly excited about combining the two sectors of tourism and property development, as well as continuing to build on the foundations of a successful family business. There is one full bathroom with shower and bath tub and toilet with sink which is separate from the bathroom. 2 big and one small towel for each person. There is a large living room with TV with Netflix and YouTube as well as we news channels, BBC and CNN. There is also a sofa with sofa bed. There is a large dining table in the kitchen under two large windows with plenty of natural light and with beautiful views of Prague's trade-mark red roof tops. Prague restaurant guide plus guides in English about Prague. This property is amazing. The space is huge, the linens are great, the bathtub is wonderful after a long day walking. Ilan greeted us and ensured we were oriented. It was SO quiet as well! It would be difficult to find fault with this beautiful apartment. You couldn't be closer to Prague's main attractions, and yet be able to have a quiet night's sleep. It is spacious and tastefully decorated, with a well-equipped kitchen and all the bathroom and laundry essentials. For those who like to relax in the evenings there are a lot of TV channels and Netflix. This was our first trip to Prague and the big bonus, was the timely communication from Ilan and Veronika who went beyond the expectations of a rental agreement and made sure we had up to date written information on managing arrivals and departures. On arrival we were met and given lots of additional information on getting the most from our visit. We travel a lot and generally use rentals. This is one of the best we have used. Thank you for your review. It was lovely meeting you and we very much hope to see you again. Perhaps next time try any one of nine other Prague apartments. We also have a very exciting new property in the Jewish qu which we are launching this February (2019). It is a newly renovated cubist in style two-bed with standing bath tub and sauna and promises to be our most luxurious apartment yet. You can find all our apartments here with our new property coming soon. Thanks again for your review. 2.NEW! Quiet, stylish and unique Old Town Hideaway with Patio, Old Town squ 2 min. 3.Classical Charm Space, VIEWS, Building with History, 2 min Old Town squ. Family of 4 including two teenagers. We booked this apartment approx 9 months in advance and communication with the owners was excellent leading up to the stay. Thanks to IIan for the orientation to the apartment and the local area. Location was fantastic and everything we wanted to see and do was within walking distance. Very secure apartment that was super quiet and well furnished. The kitchen had everything we needed to cook two big family dinners over the Christmas break. There are 4 different options for making coffee - plunger, machine, drip and Italian stove top. Heating was perfect and ensured we were comfortable during our stay. Prague is beautiful and we would not hesitate recommending this wonderful apartment. You cannot beat the location! It is close to Old Town Center and within walking distance to so many of the important sights of Prague. The apartment is lovely, roomy and not wanting for anything. Ilan and Veronika are very responsive and helpful. We enjoyed our stay and would certainly stay there again upon returning to Prague. The apartment has all you need for an enjoyable stay. It was spotless and very secure. You are in walking distance to all the main sights other than the castle, which is a short tram ride away. Ilan the host was very informative and kindly booked our taxi to and from the airport. Would definitely stay here again if we were to return to Prague. The apartment was quiet and yet in the center of old town. The perfect location to visit the sites or excellent shops nearby. The apartment was extremely clean and quite comfortable. We loved the big kitchen and enjoyed our breakfast every morning. The Morris’s were absolutely fantastic hosts. They helped us with transportation, recommended “Easting through Prague” and it was one of the best tours we have done. They also recommended a local restaurant and it was the perfect way to end our time in Prague.Thank you so much!!! !